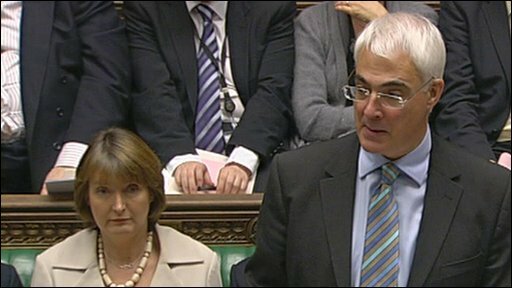 The Chancellor, Alistair Darling, has defended the Bank of England's secret loans to RBS and HBOS in an emergency statement to parliament. Mr Darling said that any disclosure or leak of the operations would have seriously jeopardised the financial stability of the system as a whole. He added that there had been no cost to the taxpayer. It emerged on Tuesday that the two banks were secretly given £61.6bn last autumn to keep them afloat. Both banks had repaid the loans by January 2009. The shadow chancellor, George Osborne, said it was important that the Bank of England was allowed to carry out its function as lender of last resort. But he added that it "raises the question of how...these banks came so close to collapse in the first place". He said it underlined the need for fundamental reform to increase the power held by the Bank of England rather than regulators. Liberal Democrats Treasury spokesman Vince Cable said he agreed in principle with the action but wanted to know why the government had waited so long to announce the details of the loans in public. Earlier, the government's City minister, Lord Myners, said Lloyds shareholders had been kept fully in the picture about the Bank of England's actions. Lloyds was in the process of buying the struggling HBOS at the time. Mr Myners denied that the "books were cooked", saying the Bank of England's accounts were audited and showed the impact of the support. He added that the European Central Bank and the Federal Reserve had also carried out similar covert operations.